Since several decades, decentralization has been implemented in many countries including Indonesia. Not only devolving expenditure-related authorities, but Indonesia also devolved some revenue collection authorities. By using Law 28/2009 regarding local taxes and charges, central government wants to enhance local fiscal autonomy without burdening local economy excessively. The central government believes that local taxes and charges assignment policy is needed to achieve the purpose of the decentralization system, i.e., the prosperity of the people. As stated in its general elucidation, this policy is crucial in providing the local governments ability to manage and match their budgets and public goods/services provision choices. Furthermore, this law claimed that this policy can increase the accountability due to the closer link between revenues collection and its benefits to the people. After seven years, an evaluation of the implementation of Law 28/2009 is imperative. Therefore, this study tries to evaluate its basic objective achievement, i.e. enhancing local fiscal autonomy without harming the local economy. This study utilizes a mixed method through combining qualitative interview, statistics descriptive, and panel data regression. This study finds that this policy has increased local fiscal autonomy across government levels and regions. 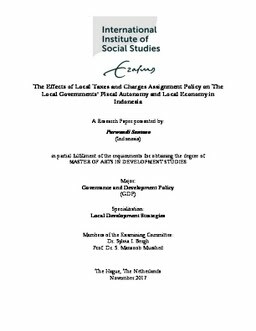 Furthermore, this study reveals three findings regarding the qualitative aspects of local fiscal autonomy after the implementation of Law 28/2009. Firstly, there is a wider disparity/gap between government levels and regions than before. Secondly, there is evidence on how conscious provincial governments have tried to utilize their tax/charge rates discretion as a manifestation of fiscal decentralization. Lastly, there are some “classics problems” that affected the performance of local revenue collections in the interviewed local governments, i.e. human resources, the quality of regulations, and public awareness. On the quantitative analysis, the result of regression shows that the local fiscal autonomy produced by Law 28/2009 has significant positive effect on local economic growth. In conclusion, although there are some deficiencies, this paper reveals that this law has achieved its main objective to increase the local fiscal autonomy and prevent the negative effects on the local economy.